Classic polo shirt with embroidered Opel flash and Opel Motorsport print on the back in high-quality piqué quality. Neckband and last with tone-in-tone buttons. Hooded sweatshirt with kangaroo pocket in a modern fit. The high-cut neck finish, the Opel Motorsport print on the chest and the embroidered Opel flash on the sleeve complete the sporty design. The Hoodie from strong quality and soft, pleasant inside convinces not only by its casual design but distinguishes itself also by a pleasant wearing comfort. 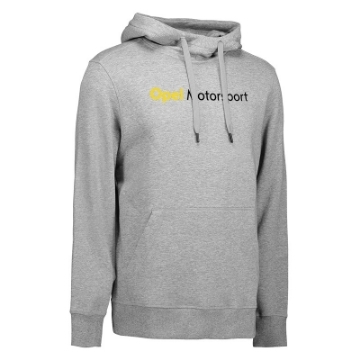 Lightweight softshell jacket in soft, stretchy and three-layer softshell quality with Opel flash and Opel Motorsport print. The functional membrane has wind- and water-repellent properties. The body-hugging model with hood, pockets without seams and beautiful contrasts is not only modern, but also a must-have for all motorsport fans. Stylish men's Motorsport shirt with front print with asphalt effect. Neck print: print: "Opel lightning"